If you care about making more money and keeping what you have. If you want to make your business grow internationally as well as increasing your earnings, optimising your investments and legally easing the tax burden by setting up an offshore company in country with lower tax rates. We are a corporate service provider registered in the United Kingdom. Our organisation provides onshore and offshore company registration and bank account opening globally. We offer business services that will simplify the management of your business. Our company plays a unique and important role by delivering services in difficult financial fields, where you have to find a solution to stimulate the growth of your business. Not only can we save you money, we are at the cutting edge of assistance delivery to our clients. Our company takes its strength from the expertise of both local and foreign staff, focusing on crucial factors such as security, safety, honesty, timely delivery and an up to date inventory. We do our best to satisfy our clients, enabling them to reach their goals, regardless of their circumstances. Client satisfaction is our most important core value. Offshore Desk applies customised solutions and strategies to increase the efficiency of your business and reduce your tax expenses by using techniques that are completely legal. We simplify the process of establishing an offshore business, by minimising your paperwork and your involvement in the bureaucratic process. We are constantly using this knowledge for our own business activities every day as well as for our portfolio of clients, so we are adept at avoiding mistakes during the company formation process and while maintaining the offshore company. We provide a bespoke service, individual to your company's needs, and work in partnership with you to build a corporate structure that both reflects your circumstances and makes your life easier. We can help you to setup offshore company with bank account and will arrange the entire administration without you leaving your desk. That let you be a winner once everything is ready. Before getting in touch with us, most of our clients have spent plenty of time on the internet searching the exhaustive information available related to offshore business activities. Accumulating material from different sources can be a time-consuming process. We believe it is much more efficient to have all the necessary data in one place, so we have amassed all our clients' top search queries and frequently asked questions and presented all this information in our Offshore Business Guide. 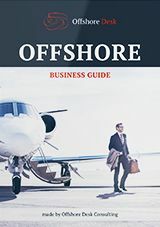 This is useful for beginners through to advanced business people, so save time on your searches and start learning from the Offshore Business Guide now. Offshore company registration process is not as difficult as you can imagine. you usually need to register a company in a jurisdiction within a good financial climate, which will help to take your business to a new level, as well as improving the quality of service you provide to your customers. This process brings many benefits, which can make your business efficient and is a safe alternative for business development. The main advantage of starting to run an offshore business is taxation. Some countries have rather high taxation rates, so you can legally reduce taxation rates by setting up a company in an offshore jurisdiction or onshore country using strategic corporate tax-planning methods. Besides taxation benefit, this kind of venture can open up opportunities for the entrepreneur to diversify into financial and business oriented targets across the world. A lot of businessmen choose offshore company incorporation for international enlargement of their businesses. Entrepreneurs should investigate new locations. First they explore their own region and secondly look at other countries. Any organization should choose a destination for its offshore company formation very carefully, because there are plenty of factors that are important. For the entrepreneur with a satisfactory 'return on investment', the offshore company has to be efficient to gain opportunities. Before examining a jurisdiction, it is necessary to consider several things and answer some questions: Does the country have a demand for the specific products you deal with? Is the country you have chosen politically and economically stable? Is your product in line with the culture of this country? Does the country have business-friendly policies? All modern companies choose offshore company registration, because its benefits are really prominent. Following this path, they become more competitive while gaining significant financial advantages. The benefits that arise from offshore company incorporation include a trader being able to: access global markets; trade in any kind of products; deal with any currency; and being able to work around the clock. Setting up an offshore company is complex, and as an owner you should be mindful of various complicated factors. Only a professional in that specific business is aware of all those factors and he or she is the best person to give you assistance in your intention. You can use the advice provided to create a Limited Liability Company (LLC) or an International Business Company (IBC), which are two widely prominent types of companies that are registered offshore. Use our Company Formation Desk to create your own company configuration. If you know exactly what you need, our Company Formation Desk can help you. You can choose your favourite jurisdiction and select additional services if necessary. Be advised by our Company Planning Centre. To be advised on which strategy would be suitable for your company, the Company Planning Centre can configure several solutions for you to choose from. Once you are satisfied with your choice, you can pre-order it or find out more from your Relationship Manager. Contact us to incorporate your company. Is your situation or company unique? Or are you finding difficulty choosing the best option? Then please contact us. We will help you to build the right structure as soon as is convenient for you. Following the theory of three flags company formation, you obtain one of the best solutions. The company is incorporated in the Seychelles with a bank account opened in Cyprus (you may choose any bank you like from our list of banks), while you are a taxpayer of any other country. 2 Bank accounts introduction (one for UK LTD and one for Hong Kong LTD) *You will have an opportunity to choose the bank from several options. The UK Agency Company is a simple offshore/onshore relationship between a few companies. For example, if an offshore company wants to trade or conduct business with several clients based in different countries, to facilitate transactions and elevate business status, the offshore company (the principal) incorporates an onshore company in the United Kingdom (the agent) to implement trading activities with the principal’s customers. 2 Bank accounts introduction (one for UK LLP and one for Seychelles IBC) *You will have an opportunity to choose the bank from several options. The UK LLP (United Kingdom Limited Liability Partnership) is widely used nowadays for carrying out different commercial activities like international sales. Some reasons for UK LLP’s popularity include the fact it is a corporate body with a legal personality that provides limited liability to its members, and it is tax-transparent. Assistance in Bank account opening *You will have an opportunity to choose the bank from several options. The Delaware Limited Liability Company (LLC), which is formed by non-residents, is not actually a partnership or a corporation, it is a particular business structure that offers a reasonable alternative to partnerships and corporations. It blends the benefits of both partnerships and corporations: corporate benefits of limited liability, and the partnership benefits of pass-through taxation. In contrast to the US corporation, a Delaware LLC does not pay US state or federal income tax if its owners are not US residents or green card holders and the offices are situated outside the US, and the LLC runs no business in the US. A Delaware LLC is a widely used option for running an international business. Being one of the lesser-known offshore jurisdictions, Vanuatu is one of the most highly secure locations among all the other offshore countries. Businesses considering company formation in Vanuatu benefit from conducting business on behalf of a Vanuatu based company. Vanuatu’s government enables favorable commercial outcomes for foreign residents: a common law legal framework, zero corporate tax rate and minimal compliance costs provide an accessible and stable platform from which an offshore company can be successfully launched and operated.